You know it’s a crazy market when you have to call 49% of Vancouver condos selling over asking price a slow down. While it’s probably not the number local buyers were hoping for, any slowdown is welcoming news. 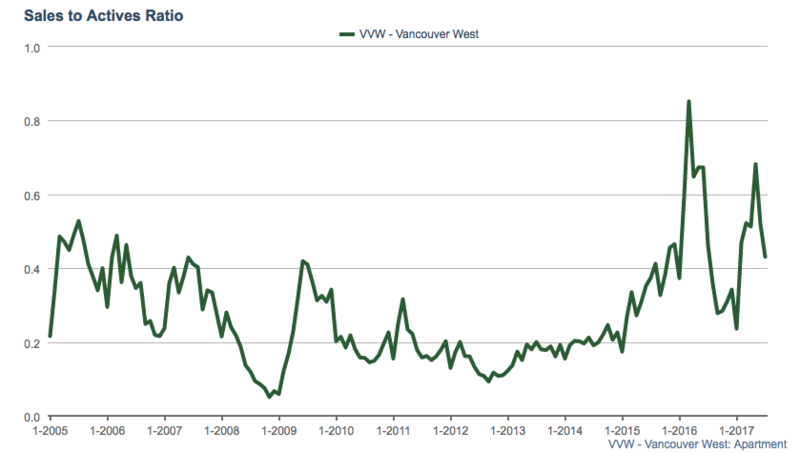 In July, the percentage of Vancouver West condos which sold over asking price dropped from 53.9% in June to 48.6% in July. The sales to actives ratio which is key indicator when determining market conditions also slid downwards in July. The ratio fell from 68% to 43% for Vancouver West. This is part of a seasonal down trend which is expected this time of year, however, it’s also a decline of 7% year over year. Vancouver Condo Sales to Actives Ratio Drops to 43% in July, 2017. Despite the minor slowdown, the days on market remains virtually unchanged. The median days on market for Vancouver West condos is 9 days, which is the exact same as it was a year ago. Overall it’s a welcoming cool down, if you can even call it that. It sure beats a sales to actives ratio of over 200% for one bedroom condos on the East side.